On May 16th, the day that would have been my grandmother’s 82nd birthday, Benjamin Nels joined our family. After the drama that surrounded Silas’ birth, we were looking forward to having a much less stressful birth this time. I just knew in my heart that Ben was going to be easier. 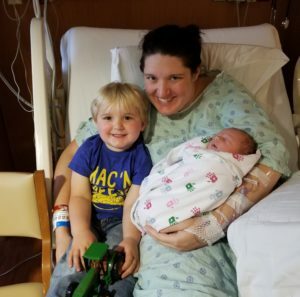 Once again I developed a pregnancy condition called intrahepatic cholestasis of pregnancy, but that was something I knew was likely to come and while scary and extremely uncomfortable, at least I knew what to expect this time around. Ben, however, had been cooking up drama all along we discovered. Writing has been my therapy since I started this blog, so buckle up as I share the story of how Ben has tried to kill his parents with stress and worry over the last three months. A “large birthmark” doesn’t exactly encompass what we discovered as we met our sweet baby boy. Ben was born with what is called a giant congenital melanocytic nevus. Basically it’s a huge mole that covers his entire back as well as most of his belly. 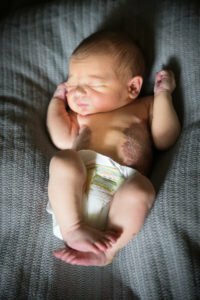 While a baby born with a small nevus is quite common, only about 1 in 500,000 babies are born with a giant nevi. We soon learned that while the main issues facing Ben were cosmetic and likely physiological as he got older, there was also a chance that Ben could have melanin deposits on his brain that could alter it’s function. We also learned that children with giant congenital nevi are at a much higher risk of developing melanoma. Then there was the additional curve ball Ben decided to throw at us. When Ben was born he had a small lump about the size of a nickle, in the middle of his birthmark, on his lower back. 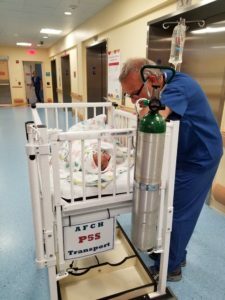 The hospital where he was born didn’t say anything about it but by the time he was two weeks old and we had our first appointment with a pediatric dermatologist, it had tripled in size. The day we met Dr. Arkin, is a day I will never forget. We arrived at her office so very scared and unsure. As a dermatologist, she knows all about birthmarks and nevi. But she took one look at the lump on his back and stepped out of the room to make a few phone calls. When she returned, this sweet and caring doctor who was also very pregnant, gently broke the news that we wouldn’t be going home that afternoon. Instead we drove from her office to the American Family Children’s Hospital where a bed was waiting for us, as Hubs drove, I completely broke down. 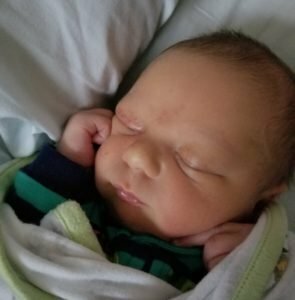 Our stay at the hospital ended up lasting 5 days. While we were there Ben was put under general anesthesia to run an extensive MRI looking for any signs of melanin deposited on his brain or spine. The hardest thing I have ever done in my life is to hand over my tiny, 3 week old baby to the anesthesiologist. We thanked God when the doctors told us that everything looked exactly as it should. A day later he was in surgery to biopsy the lump on his back. When Dr. Mount came out of surgery carrying a camera we both knew we had more “rare” on our hands. The tumor didn’t look like anything she had seen before. Samples were sent off and we waited for the phone to ring. When it did, we got the worst news that could come, the lump wasn’t just a lump, it was a tumor and it was cancerous. They suspected it was some sort of sarcoma, most likely a fibrosarcoma, but they weren’t positive. Within 3 days of the biopsy it had grown so much all of the stitches had ripped out. We found ourselves back at the hospital, and in a weird twist of fate, under the care of Dr. Garland, the same amazing plastic surgeon who had done Cathy’s skin grafts after her accident. At a month old, Ben once again had surgery, this time to remove the tumor and areas around the tumor to make sure they got all the cancerous cells. 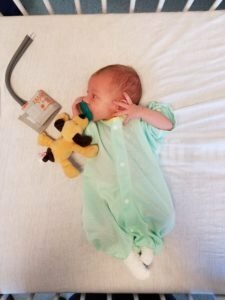 We had been prepared to be at the hospital for a week or longer, and expected our son to come back to us with an open wound that would need skin grafting to close. Instead, Dr. Garland skillfully closed the wound and we were able to head home the next day. I am not an extremely patient person, waiting to hear what type of cancer your child has is not the type of waiting that anyone should ever have to do. But we kept hearing the word “rare” over and over again. Finally a piece of the pathology came back and it ruled out any type of sarcoma and we were back to square one, not knowing what exactly we were dealing with. So once again we waited. Meanwhile, we had to deal with the poor planning on our part that was having a baby in the middle of the busiest season on a farm. 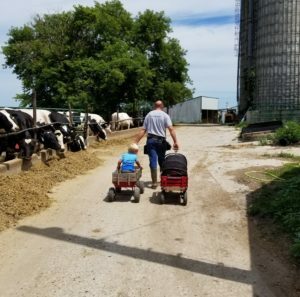 Our spring was very wet, planting was delayed, our alfalfa crop was growing quickly and despite what felt like our world crashing down, the cows still had to be milked every day, twice a day. After waiting a few more weeks we got another phone call. It was the call that every person and their loved ones who are diagnosed with cancer hope for. After further pathology, the tumor was found to be a mesenchymal proliferative nodule, a rare but non-cancerous tumor that shouldn’t require further treatment after it was removed. Once again we thanked God and cried tears of joy. Ben was healing nicely and we thought we would finally get back to our new normal, raising two boys on our farm. Once again Ben had other plans for us. While he is cute, he also seems to really enjoy screwing with his mama and daddy. This time we noticed that there was a small lump that seemed to be getting bigger at his incision site. Once again we headed in to see our amazing team of doctors at American Family Children’s Hospital. After some testing it was decided that the lump was just a seroma, a little pocket of fluid that the body would absorb after a week or two. A month later we were back at the hospital again, with the lump more than doubled in size. This time they tried to drain the seroma, but when they inserted the needle, instead of clearish fluid all that came out was blood. 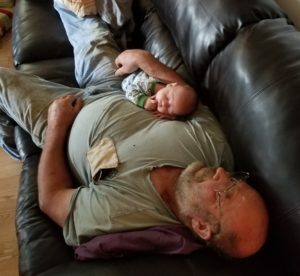 We made phone calls and sent text messages to make sure someone would be able to feed and milk the cows for us that night while we waited to be called back for another ultrasound. This time it turned out that Ben had once again developed a rare complication from his tumor removal surgery and had acquired a lumbar hernia. The lump that bulged out on his back when he cried, was actually the fat that surrounds his kidney. Once again, Ben had surgery. 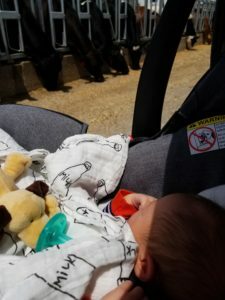 This time, it was a same day procedure and although we are only a week out from surgery as I write this and I am afraid to jinx us, it seems that we are finally through the the hardest parts. Hubs and I are both so incredibly and deeply grateful for not only having a truly amazing medical team and hospital caring for our family but also for our community that supported us through these last few months. There were many days where I would not have made it off the floor to care for our sweet blessing without the help of our friends. 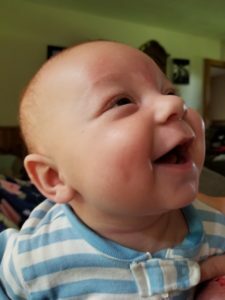 Today Ben is a happy, smiling baby and our family is ready to move forward in life and that is the greatest gift we could receive. « Humans of Agriculture- The Henry’s Story. 8 Comments on Meet Ben. Oh Carrie! I hope this is the start of a very long and healthy life for Ben. He’s beautiful! Congratulations! Now get some sleep! Isn’t it amazing that there are doctors in this world who can work miracles like this? Ben is a very lucky boy, and you have a lovely family. Dairy on! Oh my goodness! Thank you for the last sentence. It makes it all worthwhile. Praying that you have hit all the major bumps in the road and don’t hit any more. The last sentence makes it all worthwhile. Praying that you have no more major bumps in the road. Thank you for sharing your story. Those of us who follow you but have never met you care about your family. I hope this is the end of Ben’s medical issues because there is nothing worse than a sick child to worry about. I’ve kept you and your family in my prayers and I’m thrilled that things sound they are getting back to “normal” for you all. Stressful situations like that are tough, but when you add a family run farm to the mix it can take you crashing down fast…so thankful you have had the support of so many!!! Oh my gosh – holding my breath while I read this. So wonderful to read that it looks like you are out of woods. Yes, a blessing. Welcome Ben and congratulations to you and your family.